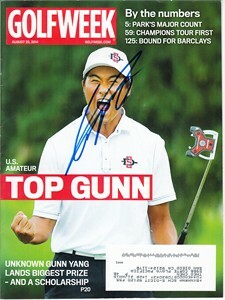 2014 Golfweek magazine autographed in blue marker by U.S. Amateur Champion Gunn Yang of San Diego State. Obtained in person, with certificate of authenticity from AutographsForSale.com. ONLY ONE AVAILABLE FOR SALE.